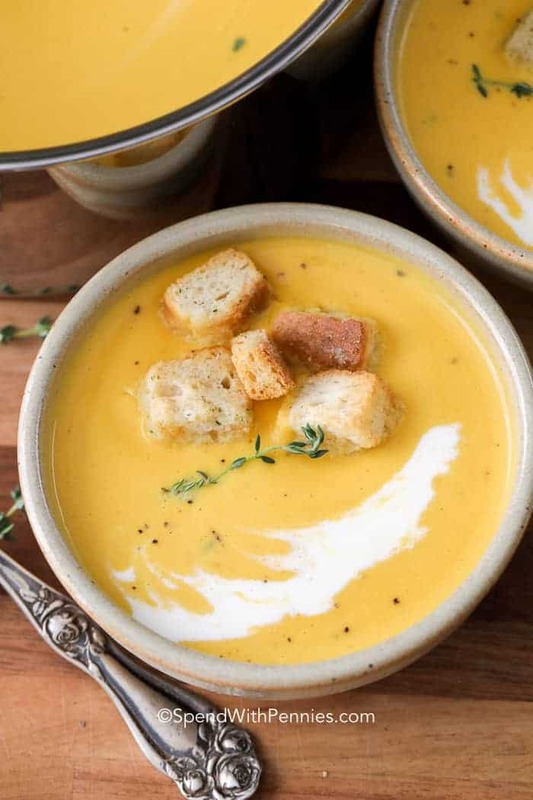 This Butternut Squash Soup recipe is the only thing you’ll need to stay warm this season. 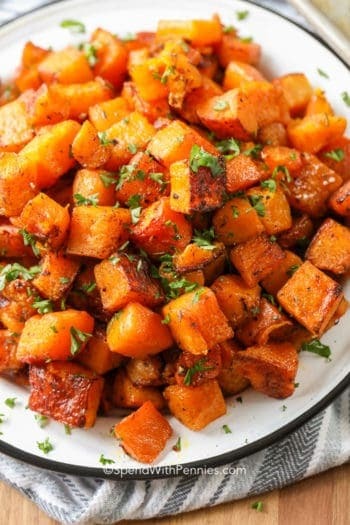 Sweet roasted butternut squash is simmered with onions, broth, and spices then pureed to perfection. Stir in a little cream and serve it alongside homemade dinner rolls for the ultimate cool weather soup! 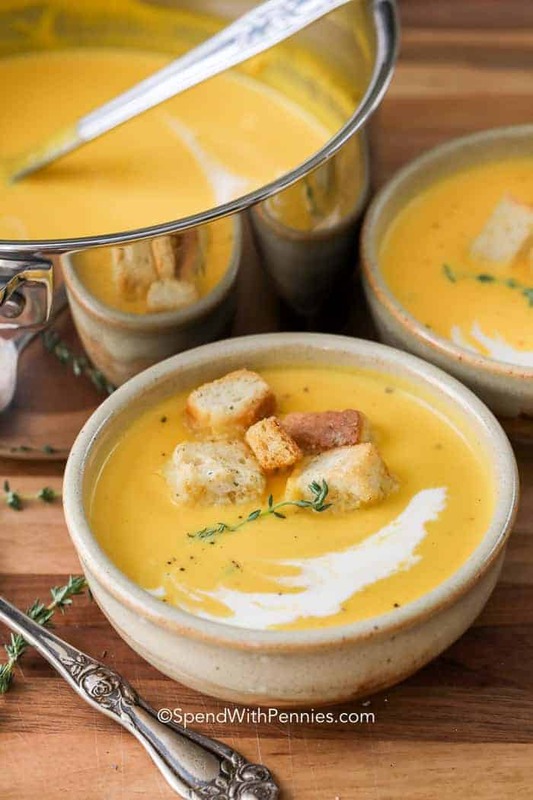 There’s just something so inviting about squash soup be it pumpkin soup or butternut squash soup, it always manages to hit the spot! Roasted butternut squash soup starts with (of course) roasted butternut squash. 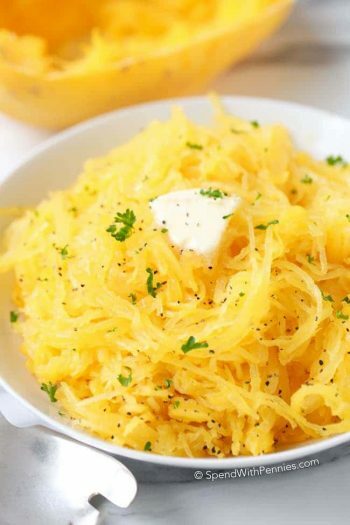 This adds flavor and a bit of sweetness (plus makes the squash easy to cut and no peeling needed). While the squash roasts, saute the onions for a bit in butter. Butternut squash can be hard to chop so in this recipe, I simply cut it into 4 and scoop it once it’s soft. 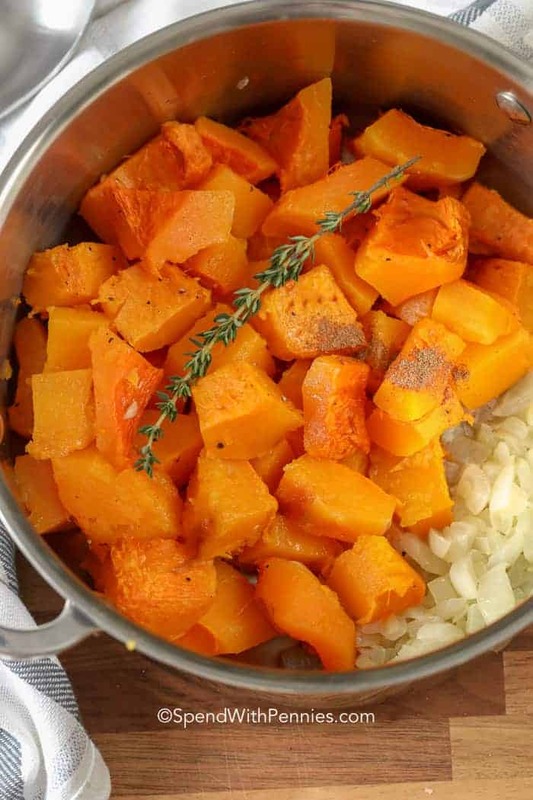 Butternut squash is rich and sweet so I love to add in a small peeled granny smith apple. This adds a hint of freshness to the soup. Add in an apple and the remaining ingredients, and simmer. I prefer very simple seasonings in this recipe; thyme, salt and pepper. 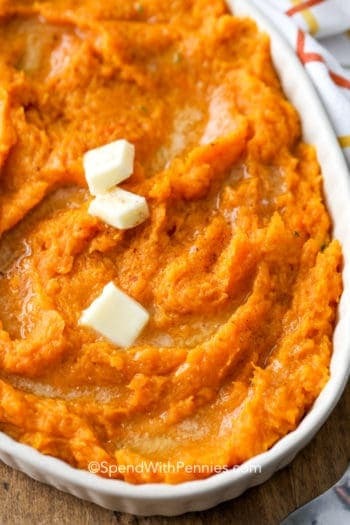 Add in your favorites though, this recipe lends itself well to warm spices such as curry powder, cinnamon or Pumpkin Pie Spice. 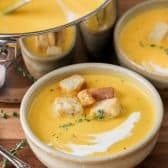 If you’re using a regular blender or immersion blender, this soup is best strained through a mesh strainer to remove any pulp and make a smooth soup. If using a high power blender (such as a Blendtec or Vitamix) there is no need to strain. 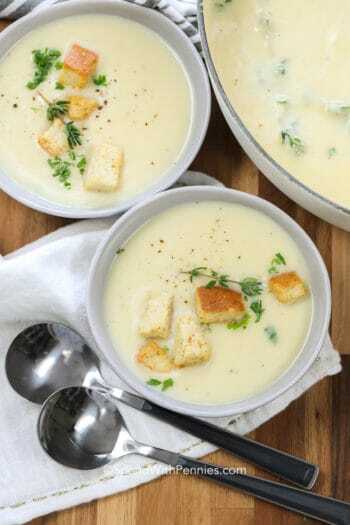 When I serve this, I like to garnish it the same way I garnish tomato soup, I top it with some croutons, black pepper, a drizzle of cream, and some fresh herbs. It looks SO fancy even though it’s really easy to make! When you make butternut squash soup, it thickens from pureeing the ingredients. Cornstarch and other thickening agents aren’t needed and don’t do very well in squash soup as the flavors are so delicate. 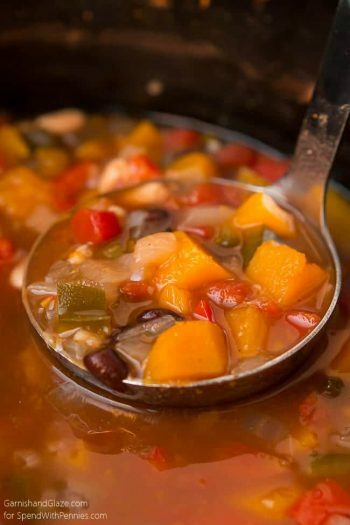 If your soup is too thin, return it to the pot and allow it to simmer to reduce. I love serving this soup as an appetizer course for some other fall favorites like pork tenderloin served alongside roasted root vegetables. Don’t forget the pumpkin pie for dessert! This soup is also perfect alongside a grilled cheese, which really lets you get every last drop from your bowl. Butternut squash soup is rich, but a very light and delicately balanced flavor. It is on the sweeter side, so I love serving it alongside pork tenderloin. Grilled or baked chicken breasts also go great alongside this soup! Butternut squash soup freezes extremely well, making it even better for the winter months. I like to freeze it in freezer bags and reheat them as we need! Just add the cream once it is defrosted. Make sure the soup is completely cooled before you freeze it. To reheat it, just add it to a saucepan and allow it to defrost! How Long Will Butternut Squash Soup Keep in the Fridge? This soup should last 4-5 days in the fridge, around the same length of time as the chicken broth used in it. If you use vegetable broth, it will keep an additional few days. If you are hoping to keep it longer, just pop it in the freezer! Beef Stew Recipe – Classic recipe. Homemade Chicken Noodle Soup – Just like Grandma’s! 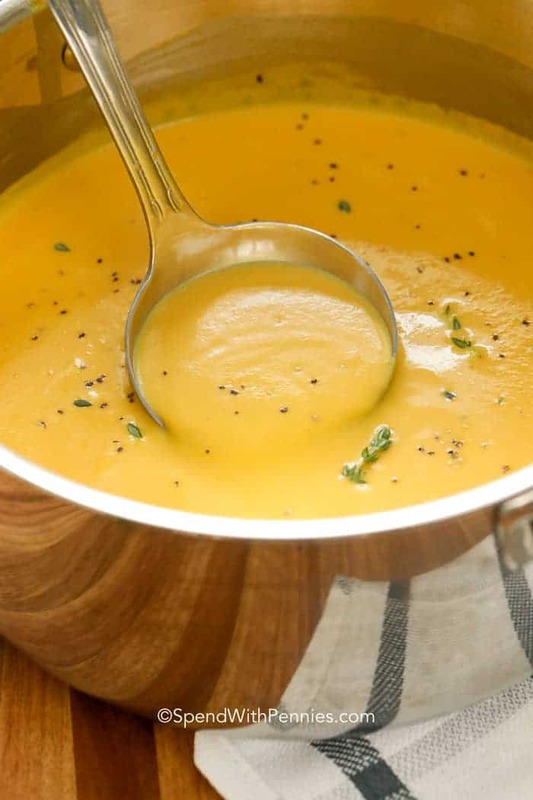 Rich and creamy roasted butternut squash soup is a great way to warm up on a cold winter day! Preheat oven to 400°F. Cut squash into four large pieces. 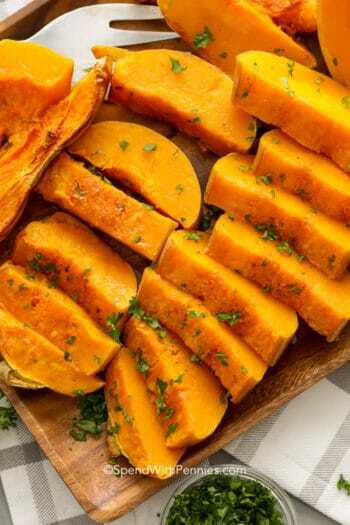 Place in an oven-safe dish and roast until the squash is soft (about 1 hour). Scoop the flesh of the squash and set aside. Melt butter in a medium pot over medium heat. Add onion and cook over medium heat until softened, about 5 minutes. Add the squash, broth, spices and apple. Bring to a boil. Reduce heat and simmer uncovered for about 20 minutes or until apples are tender. Remove from heat (discard thyme stem if using fresh). Blend until smooth. Return to pot and bring back to a simmer, stir in heavy cream to taste and with salt and pepper. If using a regular blender or immersion blender, this soup is best strained. If using a high power blender (such as a Blendtec or Vitamix) there is no need to strain.